THE OLD YARDLEY BRIDGE: In 1835, the Yardleyville-Delaware Bridge Company opened a new wooden covered toll bridge to replace a century-old ferry operation. The six-span, 903-foot-long bridge, which was built on stone foundations, was replaced with another wooden bridge following an 1841 flood. It connected the borough of Yardleyville (later renamed Yardley) in Pennsylvania with the village of Greensburg (later renamed Wilburtha) in New Jersey. After the replacement bridge was wiped out in a 1903 flood, the bridge company built a six-span, steel Warren-truss bridge on the original foundations. The Yardley Bridge was purchased by the Pennsylvania-New Jersey Joint Bridge Commission, the predecessor to the Delaware River Joint Toll Bridge Commission (DRJTBC), in 1922. The dual onslaught of hurricanes Connie and Diane during August 1955 brought record floodwaters to the Delaware River, and damaged or destroyed more than 50 bridges along the river. Specifically, the raging waters brought by Hurricane Diane wiped out three of the six spans on the Yardley Bridge. A REPLACEMENT FOR THE OLD SPAN: In the days and weeks following the hurricanes, the U.S. Army Corps of Engineers built temporary structures to replace the damaged spans of the old two-lane Yardley Bridge. However, discussions already were underway to replace the Yardley Bridge with a new highway span at Scudder Falls, just 1.3 miles north of the old span. The proposed Scudder Falls Bridge was to link to the south with the "Yardley Bypass," and to the north with a new nine-mile-long freeway carrying the NJ 129 designation to US 1 in Lawrenceville. Since the bridge was not part of the nascent Interstate highway system when it was proposed, the Federal government was to pay only half the cost of the new span, with the remainder paid by the states of Pennsylvania and New Jersey. The DRJTBC was to build the bridge, while the states were to build the approach roads and interchanges. Because Federal funding was to help defray the cost of the bridge, no tolls were to be charged. Public hearings on the new Scudder Falls Bridge held public hearings during the early months of 1958. Without much opposition in sight, the Federal government approved the location in April of that year, and construction began the following month. THE BRIDGE IS BUILT, BUT NOT THE APPROACHES: The Scudder Falls Bridge, which was built as a ten-span, steel plate-girder bridge, is supported over the Delaware River by reinforced concrete pilings with stone facing. It has two 27-foot-wide roadways that carry four lanes of traffic, and is flanked by emergency walkways. It took only 18 months to build the bridge, but by the time work finished on the superstructure (leaving only railing and light standards to be installed) in November 1959, only New Jersey had pressed ahead to build approach roads. A spokesman for the Pennsylvania Department of Highways said that he had "no idea" when southern approach roads would be built. At the same time, the states of New Jersey and Pennsylvania were negotiating the route of I-95 across the Delaware River. Pennsylvania officials initially sought to route I-95 across the Delaware River along the Trenton Toll Bridge, then north through Trenton along the Trenton Freeway (current US 1). However, New Jersey opposed this routing on the basis of the physical and capacity constraints on the four-lane bridge and freeway. The two states jointly investigated three alternative river crossings: Scudder Falls (west of Trenton), existing Trenton Toll Bridge-Trenton Freeway (through downtown), and Biles Island (east of Trenton). After further study, the two states approved the Scudder Falls alignment in 1960. The $8.4 million Scudder Falls Bridge opened to traffic on June 22, 1961. Upon completion of the new span, the old Yardley Bridge was dismantled. At the northern end, the four-lane Scudder Falls Bridge connected to a modified cloverleaf interchange with NJ 29 in Ewing Township, and stubs were built to extend to the future I-95. At the southern end, two ramps provided a temporary connection to Taylorsville Road in Lower Makefield Township, but there were no immediate provisions for I-95. The New Jersey extension of I-95 north of the bridge opened in 1964, but the Pennsylvania extension south of the bridge did not open until the end of the decade. CARRYING MORE THAN ITS SHARE OF TRAFFIC: Originally designed to handle about 30,000 vehicles per day (AADT) when it opened in 1961, the Scudder Falls Bridge was handling nearly twice that amount four decades later amid a rise in reverse and suburb-to-suburb commuting The bridge was given a grade of "F," which denotes the lowest level of service and highest level of congestion. Worse, the Delaware Valley Regional Planning Commission (DVRPC) estimated that traffic on the bridge would exceed 75,000 vehicles per day by 2030. Chronic congestion on the bridge prompted two DRJTBC studies: "Traffic Study of Trenton-Morrisville Bridge Crossings over the Delaware River" in 1990, and "Southerly Crossings Study" in 2000-2002. 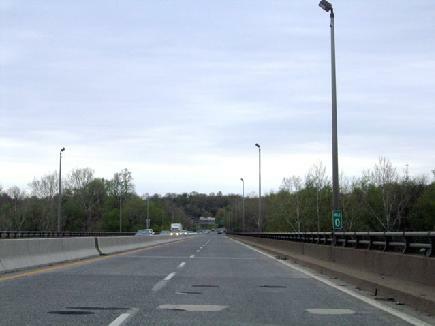 The studies concluded that the bridge's congestion and safety problems related to its pre-Interstate design standards, which were characterized by an absence of emergency shoulders, close ramp spacing at EXIT 51 (Taylorsville Road) and EXIT 1 (NJ 29), and inadequate acceleration-deceleration lanes. SHOULD BE BRIDGE BE WIDENED OR REPLACED? In January 2003, the DRJTBC signed an agreement with the Pennsylvania Department of Transportation (PennDOT) and the New Jersey Department of Transportation (NJDOT) to proceed with the environmental studies and preliminary design for the I-95 / Scudder Falls Bridge improvement project. Twin the existing bridge by building a new bridge north or south of the existing bridge. Build collector-distributor (C/D) roads for local traffic on either side of the existing bridge, and use the existing bridge for through traffic. Widen I-95 in Pennsylvania from two to three lanes (in each direction), either toward the issue or to the outside of the existing highway. The highway would be widened south to EXIT 49 (PA 332) in Lower Makefield Township. While there are no current plans to widen I-95 south of EXIT 49, it may be considered in the future, especially in conjunction with plans for the proposed I-95 / I-276 interchange in Bristol. All of the rehabilitation and replacement alternatives would accommodate three lanes in each direction for through traffic, and an additional lane in each direction for entering and exiting traffic. The preferred alternative was released in early 2005, and environmental impact studies were completed in 2006. Construction has been scheduled to take place between 2008 and 2010. At the present time, the DRJTBC estimates that the project, which will be financed by tolls on other DRJTBC crossings, will cost $156 million. Soon after the Scudder Falls project and nearby I-95 / I-276 interchange project is completed, the route likely will carry the I-195 designation. This is because the long-awaited direct interchange between I-95 (Delaware Expressway) and I-276 (Pennsylvania Turnpike) is scheduled for completion in 2012, shifting the I-95 designation to the Delaware River-Turnpike Toll Bridge. The remaining section of I-95 north of I-276 through Bucks County, as well as the I-95 section in Mercer County, likely will be re-designated I-295. SOURCES: "Routing Is Set for New Bridge Near Yardley," The Philadelphia Inquirer (2/21/1958); "Yardley Span Work To Begin," The Philadelphia Evening Bulletin (2/25/1958); "Pennsylvania Lags on Approaches to Scudders Falls Bridge," The Philadelphia Inquirer (11/09/1959); "Bridge With a But," Keystone Motorist-Keystone Automobile Club (July 1961); "Alternative Route Study: Interstate Route 95," New Jersey State Highway Department (1962); "Interstate 95," Delaware Valley Regional Planning Commission (1979); "I-95 Corridor in the Tri-State Region," Tri-State Regional Planning Commission (1979); "Commission Eyes I-95 Bridge Upgrade" by Tom Hester, Jr., The Trentonian (6/03/2003); Bridges Over the Delaware River by Frank T. Dale, Rutgers University Press (2003); "Depositions Tell of Plans To Spend" by Steve Esack, The Morning Call (6/13/2004); "I-95 / Scudder Falls Bridge Improvement Project," Delaware River Joint Toll Bridge Commission (2004); "Construction Starts on Bridge in 2008" by Chris English, Bucks County Courier-Times (2/07/2005); Jeff Kitsko; Raymond C. Martin; Dan Moraseski; Vince Profy; Sandy Smith. I-95 and I-195 shields by Ralph Herman. Back to The Crossings of Metro Philadelphia home page.